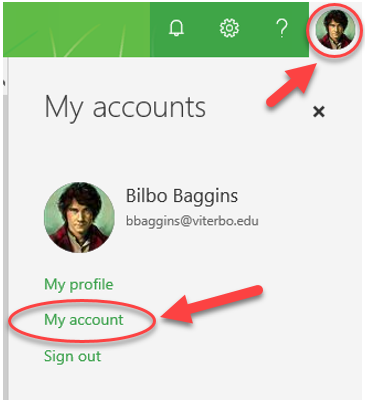 Go to the upper right to the profile-photo, and left-click for a menu - Choose "My account". 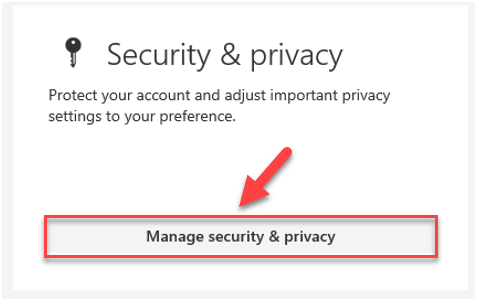 Then under "Security & privacy" click the "Manage Security & privacy" button - Then "Change Password". • Minimum passphrase length must be 10 characters. • Passphrase is required to change every 120 days (reminder 10 days before expiration). • 10 incorrect login attempts results in your account being locked for 10 minutes. • Cannot use username or any part of full-name in the passphrase. 1. Avoid single dictionary words (i.e. Giraffe123) – Instead use: G1raff3!!! 2. Don’t use personal information (don’t re-use your SSN/BD-Default in some other way). 6. Use different passphrases for different accounts/applications. 7. If you write your passphrase down, keep in a secure place, not on a note! 9. 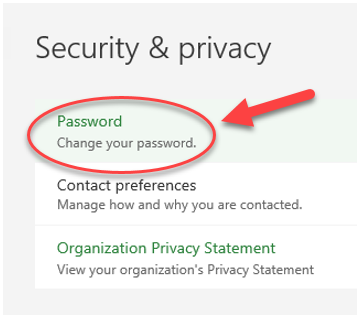 Don’t email your passphrase, and remember IIT will NEVER ask for your passphrase! Email helpdesk@viterbo.edu if you are having problems.